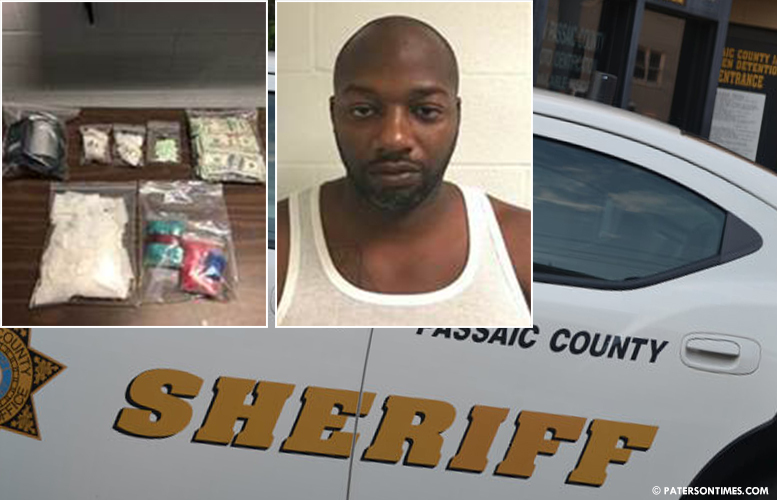 An accused drug dealer was arrested following a brief foot pursuit on Monday evening, according to Passaic County Sheriff Richard Berdnik. Marquise Scott, 35-year-old, of Paterson, is charged with 10 drug offenses and resisting arrest, authorities said. Detectives seized 90 grams of raw heroin, valued at $7,000; 42 grams of crack cocaine, valued at $2,100; 70 Xanax pills, valued at $1,000; numerous empty glassine bags, zip-locked baggies, electric grinder, and a digital scale from the master bedroom in his apartment. Also confiscated was $12,241 in cash. Scott was the target of a two-month long investigation. At 6 p.m. on Monday, detectives observed him exit his apartment and walk to 14th Avenue and East 21st Street. At the location, he met the driver of a Lincoln sedan to conduct an alleged drug transaction. Detectives observed Scott hand several small items in exchange for cash. Detectives got out of their undercover vehicles and tried to place him under arrest. Scott led them on a foot chase towards the Broadway train tracks. Scott ignored commands to stop. He was arrested few blocks later without an incident. Berdnik said Scott is being held at the Passaic County Jail. The sheriff thanked Detective Tommy Kochys of the Elmwood Park Narcotics Division for providing assistance in the course of the investigation.